I’m one of those people who believe that any food breaded and fried is just absolutely delicious. 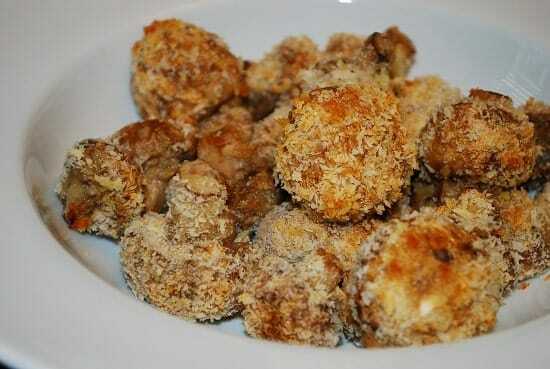 And these Baked & Breaded Mushrooms are no exception. But my version uses Panko, is baked, not fried, and is just as good, if not WAY better than the greasy fried version. The delicate flavor of the mushroom is not lost, and the crisp, Parmesan seasoned Panko breading is oh so perfect. I served these with a side of low calorie Ranch dressing, and it was AMAZING. Each serving is just 3 Points, which is a lot better than traditional fried breaded mushrooms. You can make these as a Weight Watchers appetizer for a party or potluck, or just serve them up as a late night snack for when the fried greasy food craving kicks in. These will also make a great addition to my collection of Weight Watchers Super Bowl Recipes! Though, I have a feeling that during football season this year, these Baked and Breaded Mushrooms are going to become a regular game day snack long before the Super Bowl. Enjoy! This incredibly delicious Baked Breaded Mushroom Recipe is just as good, if not better, than the fried version. And at just 3 Points per serving, these baked mushrooms are a much healthier Weight Watchers appetizer recipe to indulge in. Spray a nonstick baking sheet with non-fat cooking spray. In another small bowl, combine the Panko breadcrumbs, cheese, garlic powder, salt & pepper. Dip each mushroom into eggs, shake off excess and then roll in the breadcrumbs mixture, and set on the baking sheet. I just got done eating these-so good! I was wondering about the extra bread crumb mixture I had left over…In the future, can I use it on extra mushrooms for the same points value? Yes! The mushrooms are considered 0 Points, so if you have extra breading, feel free ti make extra mushrooms. LOVE that these Baked and Breaded Mushrooms are a healthy version to a party favourite. Perfect appetizer for this weekend. Thanks!